Without Facebook, my blog would be nowhere near where it is today. Every time I check my blog stats via WordPress, Facebook is always the number one referrer of traffic. Think about it – even the majority our parents are on Facebook these days. Depending on your demographic, Facebook could be a major way to boost traffic towards your blog. The “mom” demographic happens to be huge on Facebook, hence why it works well for my blog – and who knows, maybe it may work for yours too! 1. If you haven’t done so already, create a Facebook fan page. 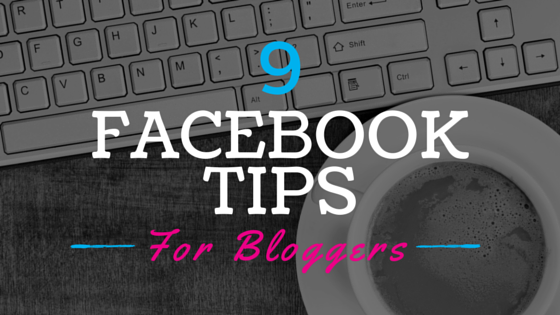 This way, you give your Facebook friends the option of having your blog posts constantly in their face (or not). Some people (even if they love you) simply aren’t interested in your interests. For example, if you blog about parenting, but your best friend doesn’t have any kids, chances are he/she will not want to read a blog on parenting. However, this doesn’t mean you shouldn’t promote your blog posts on your personal Facebook page at all. Select your most worthy/successful posts to share on your personal page. 2. Make sure your “About” page is clear. Who are you, and what is your purpose? 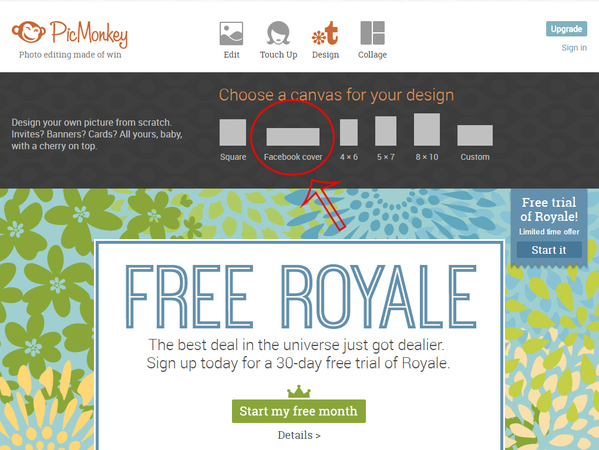 This should be obvious to a viewer upon landing on your page. A brief summary of who you are and what you do should be included in your About page. Also, your contact information should be visible as well: email, social media handles, etc. Don’t forget to provide your main website/blog URL too. 3. Make sure your cover photo is sized in the right dimensions. In addition, your cover photo should be a high-res image. The more professional your photography looks, the more professional your blog appears to others. 4. Speak in a conversational tone. Always write in a conversational tone on Facebook. Sound like you’re my friend! After all, Facebook is a social network of “friends.” Crack a few jokes here and there, or simply be friendly. Think of it as either entertaining or enlightening your friends at a party. Not only should one sound conversational, but also engage in actual conversations as well. Ask questions in your posts. (All-Star Tip: It’s even better when the question is in a graphic too.) Spark conversations! Don’t forget to reply to all your comments too. You never know when replies or other comments will spark additional conversations. There are always people reading, whether you are aware of it or not. 6. Post visuals and videos — always! Facebook is all about images. It’s a very visual social network. Try to attach a video or picture to each post. This especially helps your post pop when someone is scrolling down their newsfeed and comes across your post. 7. Be consistent with your posting schedule. Spread your posts out. Post everyday if possible, but don’t post five posts within five minutes. Also don’t post too little – you don’t want your viewers to lose interest or forget about your blog. Be consistent with your posting times if possible. Personally, I find posting in the morning between 8-9 a.m. to be most successful. Perhaps people are checking their Facebook when they wake up or while settling into work at their desk. I also find posting at night from 8-9 p.m. to be successful as well. For me, this is a time I check Facebook because the baby has been put to sleep, I’ve already ran errands, eaten dinner, etc. I’m sure other mothers have similar schedules. 8. Join similar Facebook groups. Chances are there are other Facebook pages similar to yours. Join them. You never know when other posts may inspire or spark an idea for your blog. Also, engage in conversations within those groups, since they are people who relate to you and are within your niche. 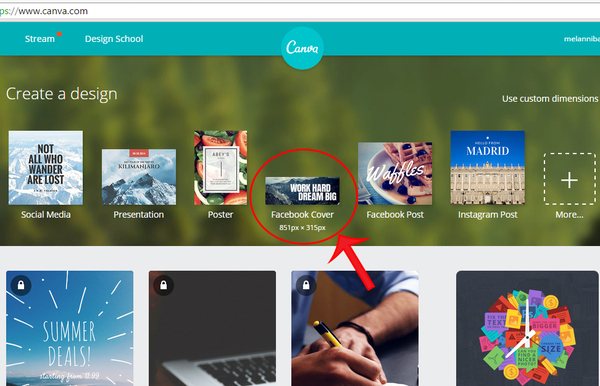 If possible, you can even promote your blog and social media in these groups. However, don’t SPAM them with your blog info. 9. Look for blogger networks via search engines and join them. 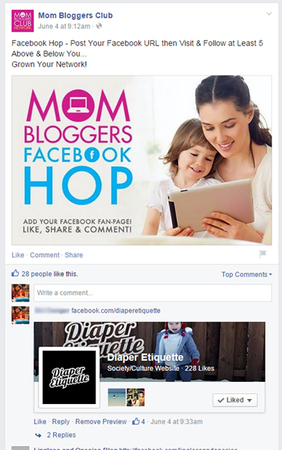 Here is one of the networks I’m part of called “Mom Bloggers Club.” They often post “Facebook Hop” posts, where people link their Facebook fan pages. As you can see, it’s easy for people to like my page, since the like button is included right there. You can find many blogger networks online, but make sure your blog is polished and ready for review. Most blogger networks have to approve your blog before accepting you into their network. Furthermore: Network, network, network! Leave comments under what other people post as well. Conversations can start anywhere. Good luck with your Facebook fan page! If you have any questions or comments, please feel free to leave them below or email me at melissa.ibarra@prnewswire.com.